If one goes from the western gate of the Great Buddha Hall (daibutsuden, 大仏殿; within the grounds of the Tōdaiji, 東大寺) about one kilometre to the north, you reach the Shingon temple Hannya-ji (般若寺, picture below). 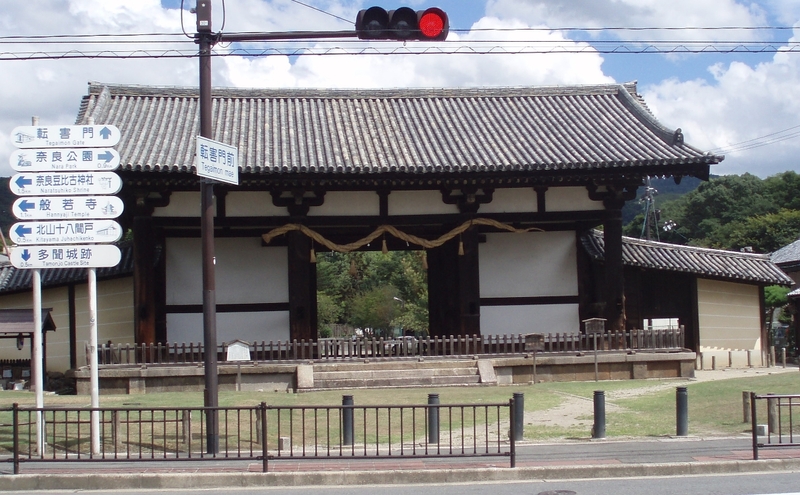 This temple was erected in 645 by Soga no Himuka (蘇我日向)*1 and was completely destroyed and rebuilt several times in the course of history, the last destruction was in World War II. In the year 1267, the sculptor Zenkei (善慶) and his son Zenshun (善春) made for the main hall of the Hannya-ji a gilded 4,8 m high statue of the Bodhisattva Monju (文殊菩薩). Because of this magnificent statue – which flooded the entire main hall with golden light during sun exposure at open temple doors – the Hannya-ji became soon the center of the Monju followers of the entire country. In 1324, an additional statue was donated to the temple, namely a Monju riding on a lion (monju-bosatsu-kishi-zō, 文殊菩薩騎獅像, see picture below). The large, older statue was destroyed by a fire in 1490 but the one with the riding Monju is still extant and was transferred during renovation work in 1667 to the main hall in place of the former one. 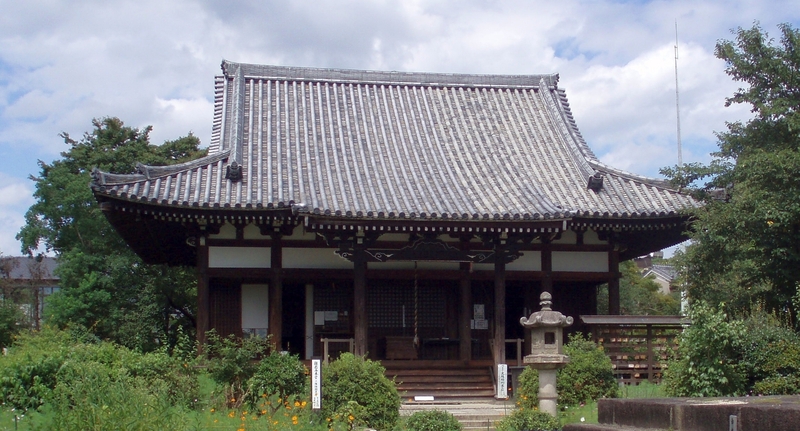 Originally the monju-bosatsu-kishi-zō stood in the hall where the sutras were stored (kyōzō, 経蔵). Monju was not chosen coincidentally as statue motif for the Hannya-ji. Monju (skrt. Mañjuśri) is regarded as bosatsu (the Japanese word for Bodhisattva) of wisdom (jap. hannya 般若, skrt. prajñā) and plays among others an important role in the Hannya-Sūtra. The deity is depicted holding a scroll of the Hannya-Sūtra in the one hand and a sword in the other. This sword is the so-called “sword of wisdom” (chiken, 智剣) with which Monju cuts off the veil of delusion of man. And our next story start with this Monju statue. When he was kneeing in front of the statue, doing his prayers, and looking at the sword in Monju´s hand, he suddenly became aware its meaning as „sword of wisdom“. At that time he took it upon himself to create a sword which should be of equal rank and quality to the sword of wisdom of his favourite deity. From then on, he always prayed to Monju for becoming a master swordsmith when making a pilgrimage to the temple. And one day when Kanenaga was praying as always in front of the statue, the form of a youngling appeared in front of him who on the spot demanded: “If you forge a sword for me, I will fulfill your wish!” The smith accepted and bowed deeper as usual, but when he got up again, the young man had vanished. “This must had been Monju´s envoy,” Kanenaga said to himself and returned hurriedly to his smithy to start with the preparations for the new “commissioned work.” First he hang-up a sacred shimenawa, looked in and near Nara for the best charcoal, and selected the finest pieces of tamahagane (玉鋼). *3 He fired the forge and started to work like a man possessed, constantly reciting the protective mantra on-arahashana (唵悪尾羅吽佉佐洛) which should ensure the help and protection of Monju. Sparks flew and soon the sword took shape. After the first foundation polish Kanenaga saw that it was his best sword and after the blade was finished, he returned to the Hannya-ji to wait for the mysterious young man. He came promptly, gratefully accepted the ordered sword, and vanished again. But from the same evening, mysterious murders happened in Nara. An unidentified person randomly killed peoples passing by and the bodies found the next morning were all killed with a single sword stroke. Thus it was soon assumed that the murder must own an exceptionally sharp blade. When some eyewitnesses mentioned that the phantom had a juvenile stature, the swordsmith begun to wonder. Was his mysterious customer a real person of flesh and blood and not Monju´s envoy? He reproached himself badly and went once more to the Hannya-ji. This time he wanted to pray for the people of Nara but in secret he wanted to see if something was wrong with Monju´s statue. When he entered the gloomy main hall he saw that the sword in the statues hand was not reflecting the light as usual. But Kanenaga put that down to the special lighting conditions of that evening and did his prayers as usual. Next morning when the first monk entered the hall for the Buddhist service he was frightened because three eggs were skewered on Monju´s sword! *4 He got closer carefully and took the sword with clammy, trembling hands, to examine it. After removing the hilt, he saw the fresh signature „Kanenaga“ on the juvenile and unrusty tang. The swordsmith Kanenaga was of course no stranger in Nara back then and so he was called to the abbot for a clarification of “facts.” The smith told the abbot the whole story of the mysterius youngling and the sword he ordered and that he thought he was an envoy of Monju because he was praying that hard to the Bodhisattva just before it all began. But the following night no more murders happened and the phantom had disappeared. It was like Monju had personally taken away the sword from the murder and put it as an evidence for his act in the right hand of the statue dedicated to him. This story spread like wildfire with the result that even more people made a pilgrimage to the Hannya-ji to bow to express their gratitude for warding off harm from them. Out of relief that everything turned out well, the Hannya-ji presented Kanenaga with a painting of Monju by the T´ang-Chinese painter Lín Feng (琳峰) and allowed him to use the name of the deity in the form Monjushirō (文珠四郎). The writing form (碾磑) which means “millstone” is derived from a certain millstone of agate which was once imported from Korea. Traditions say that the stone was positioned in the eastern area of the Tōdaiji close to the dining hall, which is quite close to the Tegai gate and so it is assumed that this writing of the gate´s name goes back to the millstone being positioned there in early times. 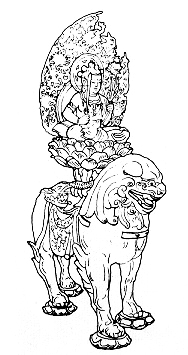 Drawing of Kanenaga´s konote-gashiwa in the Tsuguhira Oshigata. The term konotegashiwa had naturalized later for a sword with two different temper lines designs on both sides. *1 The Korean monk Ekan (慧潅) brought in 629 a statue of the Hannya deity to Japan and erected a provisional temple for her. 25 years later, Soga no Himuka replaced this construction by a “real” temple as an appeal for the healing of the sick emperor Kōtoku (孝徳, 596-654, r. 645-654). This act didn´t helped much because Kōtoku died in the same year. The first mentioning of the name „Hannya-ji“ is found in a document of the Shōsō´in repository (正倉院, Nara) and dates to the 14th year of Tenpyō (天平, 742). *2 The Monju-e is a special form of the Buddhist Day of the Dead (hō-e, 法会), where explicitely Monju´s name is recited. *3 The raw steel of which the Japanese sword is made. *4 It was believed that the three eggs were a sign of Monju with which he called attention to himself. The number of three refers to the so-called “Shaka triad” (shaka-sanzon, 釈迦三尊), a group of three Buddhist images composed of Shakyamuni flanked to the left and right by the Bodhisattva Monju and Fugen (普賢, skrt. Samantabhadra). In this triad Buddha stands for the goal of enlightenment, Monju for the wisdom, and Fugen as Bodhisattva of Buddhist practice, the only two ways to achieve this enlightenment. *5 The neighboring district is still today called Kanenaga-machi (包永町). *6 At the konote-gashiwa it is hard to tell what is the upper and what the under side of its leaves. *7 A collection of drawings of the treasure swords of Tokugawa Hidetada, made by the swordsmith Ōmi no kami Tsuguhira (近江守継平) who worked in Edo.